My family went to a maple sugar festival last winter that piqued our interest in real maple syrup. We tasted maple sugar, maple syrup, and the classic treat sugar on snow. I was happy to see that Aldi sells Specially Selected 100% Pure Maple Syrup as a Regular Buy that is on shelves all the time. In the past in our house, we’ve frequently used the more common artificial syrup for dousing our pancakes and waffles; it’s mostly high fructose corn syrup with maple flavoring. It’s what your server places on the table when you order pancakes at a diner or restaurant, and it’s what you’ll see at community pancake breakfasts and on most Americans’ breakfast tables. Many people don’t even realize they’re not eating the real thing. 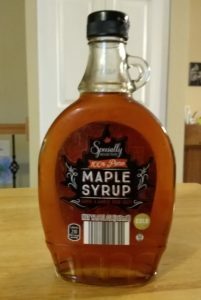 Aldi’s version of this fake maple syrup is called Aunt Maple’s Syrup, and it comes in original or butter flavors, or there’s also the lower-calorie Aunt Maple’s Lite Syrup, which is what I usually buy. Notice that it’s not even called maple syrup — it’s just called “syrup” — because it’s primarily corn syrup and not real maple syrup. My bottle of Aunt Maple’s Lite Syrup … not real maple syrup. My family loves this stuff, which is why the bottle is nearly empty. There is a reason, of course, for the fake syrup’s popularity. 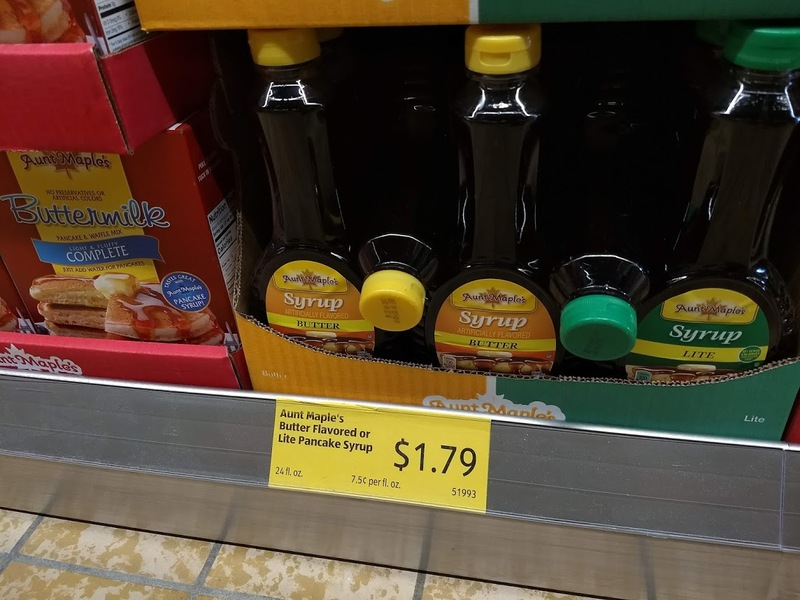 Aldi’s fake syrup costs only $1.79 for a 24-ounce bottle, while Aldi’s 100% pure maple syrup costs $6.69 for a 12.5-ounce bottle at the time of writing. That’s a significant cost difference. Real maple syrup takes time and effort to produce. It is made from the sap of sugar maple trees. The trees are tapped and the sap is gathered in buckets. The sap is then boiled down to syrup. The boiling process takes a lot of time, and it takes about 40 gallons of maple sap to make one gallon of maple syrup. All that work means real maple syrup costs more to purchase in stores. 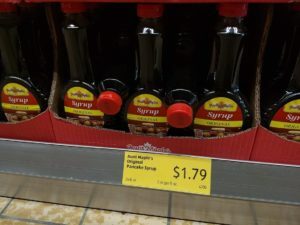 Fortunately, Aldi sells 100% pure maple syrup for a reasonable price, all things considered. Sometimes Aldi sells a larger and pricier jug of syrup as a Special Buy, but the 12.5-ounce bottle is always on the shelves. 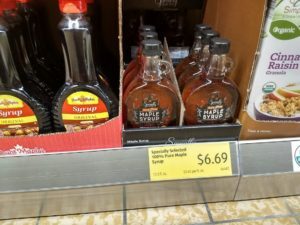 Aldi’s 100% pure maple syrup is Grade A Amber and is a product of Canada and the U.S. It contains only pure maple syrup. There is something to like about a food that is minimally processed and just like what our great-grandparents would have eaten back in the day. One serving size of Aldi’s 100% pure maple syrup is 1/4 cup, but — whether I’m using real maple syrup or the high fructose corn syrup with maple flavoring — I usually use less than that when eating pancakes or waffles. I might use 1/8 of a cup. With real maple syrup, the flavor is a bit stronger and it seems like we need less syrup overall. A 1/4-cup serving of pure maple syrup will net you 210 calories, with 170 mg (5% of your daily value) of potassium, and 53 grams (18% of your daily value) of carbs. One serving also contains 51 grams of sugars, although it’s all natural with no added sugar. One serving also contains 8% of your necessary daily calcium. 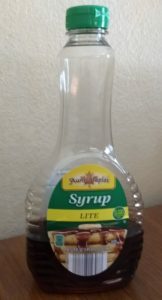 It should be noted that the Aunt Maple’s Lite Syrup sitting in my pantry comes in at 100 calories for a 1/4-cup serving, with 24 grams of sugar. So you’ll have to decide what’s more important to you: lower calories and sugar, or eating a more natural and less-processed food? It depends on how much you dislike high fructose corn syrup, which is a common ingredient in many of our foods these days. So how does the real maple syrup taste? Real maple syrup has a different flavor compared to the high fructose corn syrup we’ve eaten all our lives. The real syrup has a stronger flavor, with more dominant maple notes. It also seems to be a thinner consistency than the high fructose corn syrup variation. If you’ve grown up on the corn syrup variety, you may love the real thing, or you may not like the real thing, or it may take some time to adjust. Most of the time, my kids actually prefer the fake syrup, but sometimes they’ll request the real thing. I prefer the real stuff. So I keep both types of syrup in my house now to make everyone happy. 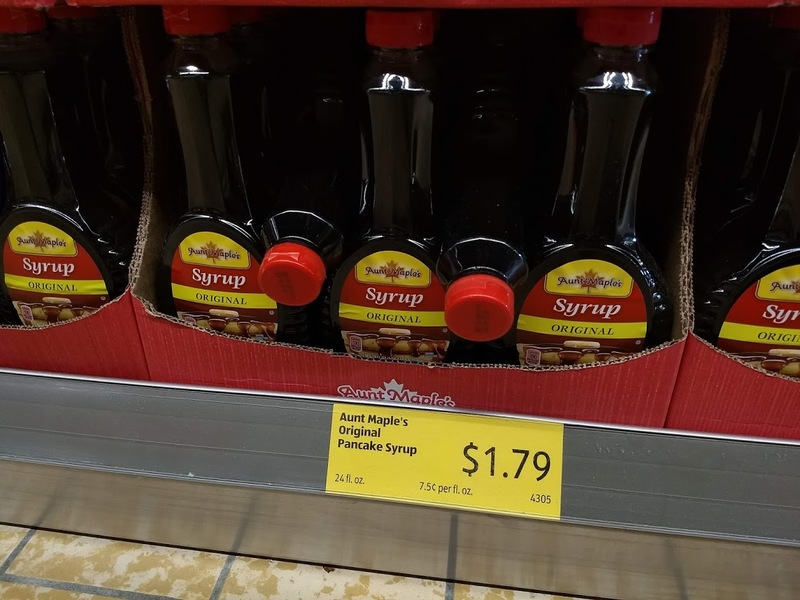 Aldi sells bottles of Specially Selected 100% Pure Maple Syrup as a Regular Buy. 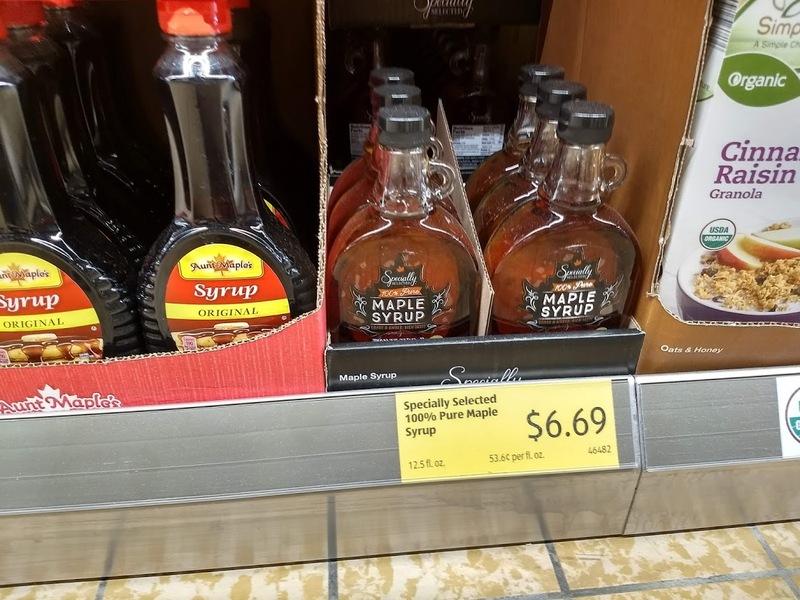 If you want real, natural maple syrup and not just the cheap bottle of high fructose corn syrup with maple flavoring, then this is a good deal. Aunt Maple's, Specially Selected. Bookmark.